Four years ago today San Onofre Nuclear Waste Generating Station shut down forever. Nobody had any idea it would be forever the day it happened: The public was told it was a "small" leak in one of the new replacement steam generators, that forced operators to quickly decide to drop the control rods, that brought the reactor safely to a stop. That didn't put out the lights anywhere. The nuclear plant was never started again, and it turns out we never needed it after all! Of course, nothing "small" ever happens at a nuclear power plant. Highly radioactive coolant which had just flowed through the reactor was GUSHING out of the primary coolant loop, flashing to steam into the secondary coolant loop. When that loop's steam was condensed by the cool ocean water of the tertiary coolant loop, radioactive nitrogen was released. Nitrogen does not condense and remains a gas, so it bubbled out and was detected by sensors inside the Unit 3 reactor turbine building. The radioactive gas was then released to the atmosphere -- to the public -- through the building's venting system. This author does not know the estimated quantity of radioactive nitrogen that was released, but with a half-life of only about 8 minutes, someone driving by on the highway nearby might have gotten a dose, but it presumably would have been quite small. I doubt anyone would even have experienced a metallic taste in their mouth (a classic symptom of breathing in a medium or high dose of radiation). The leak occurred in a thin metal tube, with wall thicknesses thinner than a dime. One tube leaked, out of over 19,000 such tubes in each nuclear reactor, which are inside of the replacement steam generators (9,727 tubes per steam generator, four steam generators for two reactors (two RTGs per reactor)). The primary coolant came gushing out at about 2200 pounds per square inch of pressure into the secondary coolant loop, which was at about 1000 pounds per square inch lower pressure. The primary coolant immediately flashed to steam, and if the operators had waited much longer to shut the reactor down, the steam could have created both a bigger hole in the tube it was leaking out of, and/or a hole in an adjacent tube. Worse yet, all the tubes in that area were vibrating back and forth in the "in-plane" direction, vibrating together in a coordinated pattern that was only going to stop when something broke -- not just leaked, but actually broke off. That didn't happen, the reactor was shut down first -- but we came very close. One tube breaking off could have caused a second tube to break off just by banging into it, especially because the nearby tubes were already worn and weakened. Or the jet impingement of the steam from the leaking tube could have caused one or more nearby tubes to break off. There's only so much water available before more is leaking out than can be pumped in -- two tubes breaking away might well be more than enough (regulations are imprecise), three tubes certainly would be too many. These tubes are only about the diameter of a human finger, but the pressures are tremendous. To prevent a meltdown, the operators had to recognize that a serious event was occurring, not just a simple leak (some leaking steam generator tubes eventually clog up with crud and stop leaking. This leak kept getting bigger). Then they have to shut down the reactor, but if the leak is bad enough that won't be enough. They would also have to isolate the steam generator. Most Pressurized Water Reactors have three or four steam generators, but San Onofre only has two massive steam generators per reactor. So it's great that San Onofre is permanently closed. But we're left with a terrible mess, that is still capable of wiping out all of southern California! There is a large committee, with nearly two dozen members, known as the Community Engagement Panel, that is pretending to try to deal with the waste that San Onofre Nuclear Waste Generating Station left behind. But it consists of hand-picked (by Southern California Edison) "volunteers" (mostly local government wonks with a few pro-nuclear industry "environmentalists" thrown in) who have no desire to go up against the Nuclear Regulatory Commission, the Department of Energy, or even Southern California Edison, who provides them with contacts in the industry who confirm the various standard nuclear lies, and media contacts, who have dutifully reported SCE's press releases for years, and dinner before the show, which occurs every three months (the next one is March 24, 2016 to be held on the hard seats in Oceanside, once again). But before talking about what to do with the waste, let's talk about how we got here. In reality, it wasn't so small a leak. In fact, southern California had avoided a Fukushima-size nuclear catastrophe -- or bigger -- by literally a hair's breadth. Thousands of steam generator tubes -- vital parts of the barrier layer between the "hot" radioactive primary coolant side of the reactor and the secondary side -- had worn away as much as 99% of their wall thickness when one of those tubes started to leak, four years ago today. The replacement steam generators in that reactor (Unit 3) had been in service less than a year. The old steam generators had been replaced at a cost to the ratepayer of well over a billion dollars when the additional cost of other replacement projects is added in. In the process of the steam-generator replacement, SCE also replaced many other parts, such as new reactor pressure vessel heads, new turbines and turbine blades, and many miles of new pipes and wires (but not nearly enough of either). None of these replacements would have been needed if the plant had not been blithely relicensed for another 20 years by the NRC, a crude lap-dog regulator. By "crude" I mean they don't actually understand their own industry. They regulate cranes, but have no knowledge of how cranes can be misused. They regulate waste, but have no idea how to store it for the hundreds of thousands of years it needs to be contained. They regulate steam generators, but don't check the thermodynamic calculations of the pressurized water reactors when those steam generators are replaced. They approve cement "islands" of nuclear waste in earthquake zones that can experience 7+, or even 8+ level earthquakes, without any understanding of the problems of inspecting that cement island for 5, 10, 50... let alone, the full 300 years they expect to use them. They fantasize that a permanent repository for nuclear waste is just a few years away. Almost everyone on SCE's CEP fantasizes that, too. This author has been tracking the Yucca Mountain project for decades. Currently, Yucca Mountain has some 300 technical, scientific, legally-admissible contentions, and there's no guarantee more aren't coming (in fact, it's a sure bet even in Las Vegas that more ARE coming!). So far only one of the contentions has been resolved. The Department of Energy held a couple of hearings on water contamination issues regarding Yucca Mountain late last year. The problems certainly run deep! These were tribal lands that tribal history tells were once fertile, and that may become wet again what with global warming and its changes in weather patterns. There are earthquake issues, volcanic eruption concerns, titanium drip shield design problems, and perhaps most of all: Transportation concerns. Some of the stainless steel casks that are being used at San Onofre can be transported "as is" by placing them inside special transport casks to reduce the radiation dose to workers (including guards and drivers) and to the public during transport, and to enhance protection from accidents or attacks. But it's one thing for a government agency to say that a dry cask is "safe from all foreseeable accidents" and another for the casks to actually BE safe. The government defines "safe" by whether or not a cask can meet certain test conditions: Immersion in fire for a certain length of time, a drop onto a pedestal of some sort from a certain height, an impact into a brick wall at a certain speed. The problem is that none of these tests are extraordinary accidents: A Baltimore Tunnel Fire type of event, a bridge falling on the cask, a tall bridge collapsing. Rolling down a 10-foot embankment might be included, but rolling across the George Washington Bridge at the moment Al Q blows it up is certainly NOT included. Neither is someone flying a modern jumbo jet into the cask while it's crossing the open plains -- a rather easy aerial maneuver, which would spread death and destruction as far as 500 miles away, depending on the wind currents. Actually, it would spread death and destruction globally, but it's been estimated by experts that you could get statistically significant deaths (instead of just random deaths in large populations) 500 miles from a spent fuel accident. So people don't want nuclear waste transported THROUGH their communities, and they don't want it stored IN their communities. So the net result is that the communities that have it -- can't get rid of it. This is the most crucial issue people living near operating reactors need to face: Do we want to have MORE of this waste problem or do we want to stop making more waste? California currently has two reactors that need to close, both located at Diablo Canyon, a Nuclear Waste Generating Station near San Luis Obispo. The lesson from San Onofre, four years after we escaped a massive accident by the skin of our teeth, is this: Shut down before meltdown. The lap-dog NRC will relicense anything, any old bucket of bolts, at any time. The California Public Utilities Commission was corrupted decades ago and has yet to be completely cleaned up. Perhaps public outcry is the only thing that is left, but by all means, don't settle for thin stainless steel casks! Thin metal has been the nuclear industry's downfall here at San Onofre once already. Let's not make that mistake again. 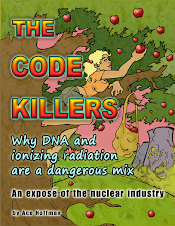 The author has attended more than 100 Nuclear Regulatory Commission hearings, either in person or via phone or web connection, as well as dozens of CPUC, CEC, CCC, DOE and local hearings on San Onofre, Yucca Mountain, and other nuclear issues. He has interviewed numerous experts and whistleblowers as well as veteran nuclear workers. He has a collection of over 500 books and videos on nuclear power and nuclear weapons. Ace lives about 20 miles from the San Onofre Nuclear Waste Dump.